Is your shopping done yet? Please tell me your shopping is not done yet. I will shed jealous crocodile tears if it is. 1) A huge thank you for your continued votes in Project Food Blog! Yesterday, I advanced to Challenge #9. I was a big ball of nerves all day I tell you. For challenge #9, they are cutting 12 contestants down to just 3 contestants for the final 10th round, so your votes will be more important than ever for this next one. Keep your eyes peeled for my 9th challenge post tomorrow. :) I’ve been working around the clock and very excited! 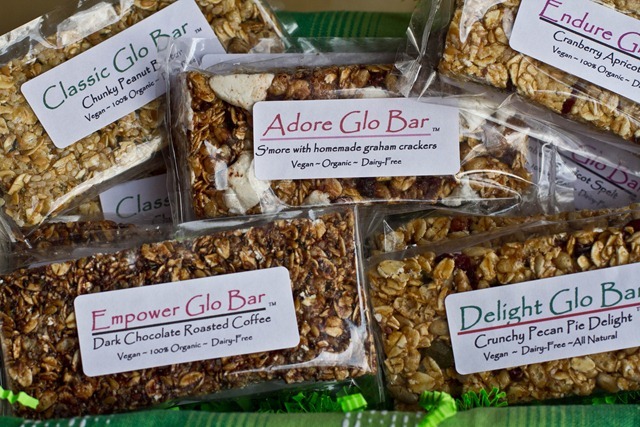 2) Holiday Glo Bar variety packs are on sale NOW (Sat Dec 4) and are expected to sell out quickly! And now on a more serious note, I talk hummus. For hummus is not to be joked about. It is serious business. The only problem with sharing a hummus recipe with you is that hummus taste preferences are so varied that it is difficult to say that this hummus recipe will be the perfect, life-changing fit for you, but I can tell you it is the right fit for me! I can also tell you that the beauty of making hummus at home is that you can play around with the recipe to suit your own needs. Add ingredients like lemon, garlic, and salt gradually so you can taste test and adapt for your own preference. With that being said, let’s get our hummus on! Directions: Place all ingredients into a food processor (except the salt) and process until the hummus is coarsely pureed. Now add in salt gradually, stopping to taste as you go. I find the salt preference of hummus varies a lot by the person, so be sure to adjust it to your needs. Also, if you use unsalted chickpeas, you may need more salt. Scoop into a bowl and drizzle with a good quality olive oil and garnish with paprika. Makes about 2 cups and lasts for about 4-5 days in the fridge in a sealed container. One thing I love about homemade hummus is that it is so quick and easy to make! The original recipe calls for 4 cloves of garlic, so I tried that out yesterday and it was way too garlicky for my liking. Two cloves is perfect for me! I also had to cut down the salt as my canned chickpeas were salted. After a few adjustments, the result was a creamy and smooth hummus with the perfect consistency. Dare I say this was better than my favourite Fontaine Sante store bought hummus? Yes, I think I do. Don’t forget to drizzle on olive oil and a sprinkle of Paprika. This truly makes the hummus pop and gives it that smooth, buttery quality going down. The recipe makes about 2 cups and provides a quick and easy lunch spread for wraps, sandwiches, crackers, and veggies. Or you can just spoon feed yourself straight from the food processor as you stand there in your hummus ecstasy. I love a good hummus! I ate an entire tub of white tuscan hummus from TJ’s in 2 days just this week. I have a hummus problem. A little hummus hint for even smoother hummus (from my Assyrian friend! ): Pop the chickpeas out of their little skins before processing… its AMAZING and so worth the time! Great tip. I’m going to try this! very true!! so worth the time, result is amazing! I LOVE making my own hummus! I also put cayenne pepper and chili powder in mine for a little extra kick. So yummy! This looks a lot like my dad’s recipe. He’s from the middle east (Tunisia) so he really knowsmwhat he’s doing. And although he might kill me for giving away his trade secrets, try adding just a bit of cumin in – it’ll take it to amwhole new level. Ps. Congratss on making it to the nex pfbz round! I’m rooting for you to win this. Not only are you awesome, but we need some Canadian representation out there. 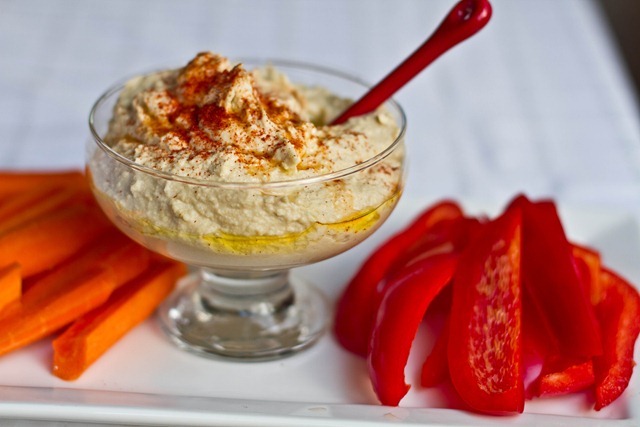 ive been looking for a clean, easy hummus recipe– THANK YOU!!! I love hummus. LOVE. IT. I asked my parents for a small food processor for Christmas and this is definitely going to be one of the first things I make with it. :D I’ve always wanted to make my own hummus. Brilliant! I read on another blog (Eating Bird Food, mayhaps?) that removing the little chickpea husks (tedious business) yields an ultra-smooth hummus. I like mine with smoked paprika on top for an unexpected zing a ling! I am so so so happy you made it through!!! I knew you would :) Now lets see you take it all the way to the top! In regards to christmas shopping……..? yeah….i’m not even close to being done! Yum! I’m a huge fan of a hummus recipe from Coconut and Lime, however hers is REALLY spicy. I think I’ll give this one a go! I love hummus! I’ve never made it myself. Did you peel the chickpeas?? Congratulations for making it through to the next round of PFB!! Congrats on moving forward in FoodBuzz! I’m voting for you! This hummus looks soooo good. I use infused olive oils with mine for extra flavor – love rosemary and roasted garlic. I’m a huge hummus fan. I use dried beans and heavily salt them while cooking–huge difference. I also like cumin in my hummus. Tabasco is a new idea to me, but I’m excited to try it! An amazing addition to hummus is cilantro!! I didn’t believe it, but it’s oh so good! Also adding different nut butters instead of tahini, so good!! I am obsessed with hummus. I actually just discovered Fontaine Sante at Costco and I swear my mom and I have become addicted. We refuse to buy any other kind. But now…you have given it some serious competition! My grandpa is israeli and makes hummus from his old family recipe ;) He soaks a big bag of chickpeas overnight then boils them and makes HUGE amounts of hummus for us that never last more than 3 days :) Yummmm, I want him to come back to visit now! Oh my goodness that hummus looks delicious! Congratulations on Project Foodblog I’ll keep voting for you! I definitely have a hummus addiction – we’ve talked before about the huge tubs from Costco… don’t get me started. :) This looks really great though – I always have a hard time making hummus at home – it is NEVER the right consistency! 1st, homemade hummus is the best and its so easy (and much cheaper) then buying it from the store and 2nd, I know for a fact that this is good cause i always add siracha to my hummus and it is beyond amazing!!!! The heat from the siracha (or hot sauce) compliments the other flavors perfectly! i am definitely adding some tabasco in my hummus! Holy yummm. That looks amazing! You can never go wrong with Ina; tried & true. Thank you thank you thank you for the hummus recipe! :) Once I have a food processor, I will be making this! Congrats on your progress in Foodbuzz – your entries are great! 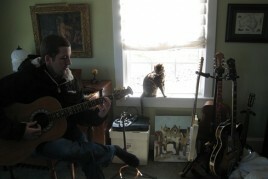 And thanks for sharing the side by side photos of you and Eric in your last post. You two look great! I just showed my husband for inspiration. Any suggestions for tahini relacements? I know it’s difficult because that gives a lot of the smooth texture. I know this is old but I use plain non-fat yogurt. Actually I use plan non-fat Greek Yogurt now. I love mixing hummus with tempeh and making a Mediterranean “chicken” salad of sorts. It’s delicious! Big congrats on moving ahead to the next round of Project Food Blog! I can’t wait to see what you have in store :) That hummus is a lot like a recipe I use from the restaurant I work in. Next time I make it, though, I’ll use a food processor (I’ve been using a blender) and add the lemon/ salt to taste instead dumping everything in at once. Yummy!!!! I don’t think that I’ve ever made or had hummus, even though I have tahini sitting in the cabinet…..now I have a yummy-looking recipe to try out!!!!!!!! Thanks! Hummus! I love it. I went to a restaurant dedicated to hummus this week. Now I shall make my own and open my own restaurant! Just kidding. But I have bought many disappointing hummuses from stores and only like one brand, so I am looking forward to trying yours! (Most likely with Mara’s tip above for extra creaminess!) Thanks Ange! P.S- I’m looking forward to voting for you in the next challenge!! Congrats on advancing! 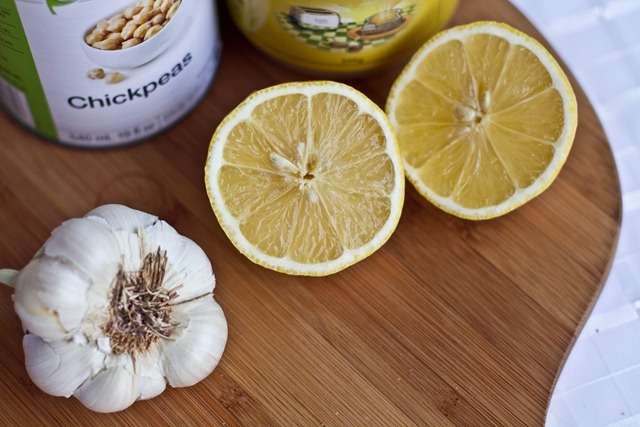 I’m definitely going to be making this hummus…tomorrow, perhaps? Or you can just spoon feed yourself straight from the food processor as you stand there in your hummus ecstasy = I’m so glad I’m not the only one that does exactly this. Congrats on advancing! Can’t wait to see what’s up next. that hummus looks diivinnee! & i LOVEEE tabasco sauce~!! Congrats on the contest -I think you have it in the bag! That hummus looks wonderful, so making it this weekend! Yay! Once you make hummus yourself, it’s really hard to go back to store-bought. And you can make so many variations – I like throwing in some roasted red peppers, or tossing in a few handfuls of spinach. Yum. Adding Tabasco to it is a great idea! Congratulations. I am making that hummus. Last time I made hummus it tasted horrible. But if you say it’s the best then I trust you. Congratulations on making it through! like the addition of tabasco…will have to try that. 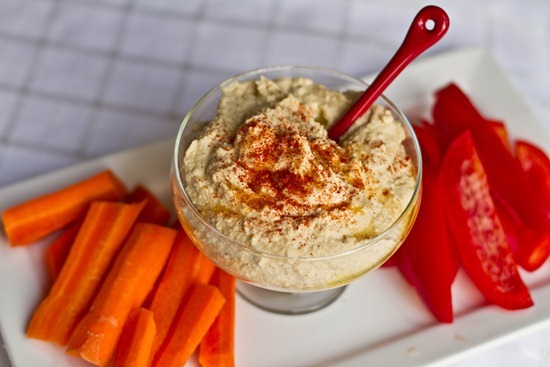 I love hummus and it is so easy to make yourself! I want to try making an eggplant hummus — there’s a version at Trader Joe’s that’s really good. I need to make my own hummus! Store bought isn’t cutting it. YEEESSS!! Thank you for the recipe!!! You know, I had hummus that changed my life the other day, too! 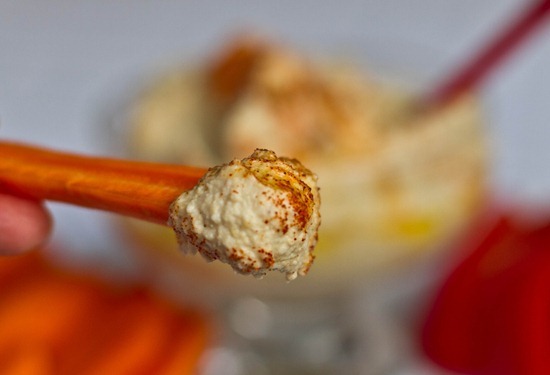 The quest for the perfect hummus is epic – I’m glad your found your own version of the holy grail! And congrats on PFB – I’m rooting (and voting) for you! anything from barefoot contessa wins in my book…she’s completely fabulous and has the BEST recipes! I know you are going to make it to the finals! Can’t wait to see your recipe for the 9th challenge. Votes are forth-coming! 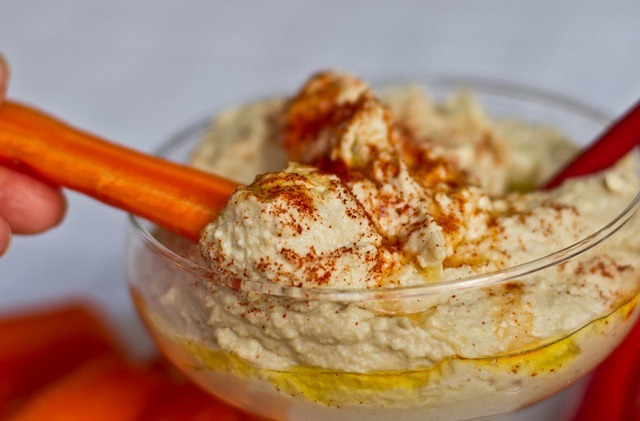 I can not believe you’ve never made your own hummus before this!! So great! I’ve been using Emeril’s recipe off the Food Network for a few years now; I NEVER buy it. Your recipe is very similar to what I do. I recommend (for variation) adding a jar of roasted red pappers or a jar of pitted kalamata olives to the base recipe. (Perhaps even less salt in the olive version). YUM!!! Congrats on discovering homemade hummus!! Looks delicious!! Will be trying tomorrow! Congrats on advancing to round 9! That hummus looks insane! I’m bookmarking this post!! Hummus is my drug. I make it all the time and almost ONLY eat it with carrots! Yum Yum Yum. You’re so right that it IS seriously business. My favorite hummus recipe is almost 100% identical with yours (the ingredients are all the same, but some of the amounts vary slightly) – and I’ll have to agree with you, it is so good! :) Since I found the recipe a few years ago, I haven’t bought hummus in the store once. I often use Sriracha instead of Tabasco, but as you say, it’s all a matter of taste. CONGRATS on the PFB – you’re amazing and I bet you’ll make it to the next round for sure ;) This hummus sounds amazing, by the way. I usually make mine from dried chickpeas… would there be any loss of flavour that way? I like to add more salt, but I never add garlic. I think I’ll try that this time around! Just made it. It changed EVERYTHING. The end. Yum! I would be right there along with you, eating freshly made hummus, straight from the food processor. I am also a serious fan of Fontaine Sante hummus, and their baba ganoush. I do make my own hummus and dips which I like as much, but sometimes it’s so much easier to open a container than make my own. I’m glad you found a hummus that you love – it really is one of the perfect foods. Congrats on Project Food Blog! So excited to see what’s in store for challenge #9. Good luck! Oh. My. God. I made this hummus last night and it is incredible. I’m tyically not a hummus fan but after tasting this, it will be a staple in my fridge. Thanks for the recipe! I love homemade hummus! You are right, it’s so personal. I always add extra EVOO and garlic. You should post a healthy vegan potato/sweet potato LATKE recipe for all the jews celebrating Hanukkah this week. I can’t bring myself to fry them in a bunch of oil. What should I do? I just received my new food processor and this is going to be my first use for it! It sounds amazing and I have a serious addiction to hummus. I can’t wait to try it! Thank you! Ahh, maybe that has been my problem! I try to overcompensate when trying to adjust the taste of my homemade hummus. That’s why I still haven’t found one I truly love. Mmmm, looks delicious! What to do if you wind up with too much hummus? (as if that is possible) Do you think it’s freezer friendly? I was wondering this myself…anyone know? I find that the more oil/tahina, the better it keeps in the freezer. More water translates to it breaking down when you later defrost it. The hummus looks really good. My step dad’s mom makes the best hummus ever, but I think this is because she is from Egypt, so it is supper authentic. She makes the best falafel too. My shopping is done because Hanukkah is half way over already. It was not be a good thing if I did not have my presents in order. Homemade hummus is so quick and easy and I love that you can change the whole flavor up with just one ingredient! 1) Congratulations on PFB! You are awesome! 2) Do you know when you’ll have more holiday variety packs available? You were right, they sold out fast! I’d love to get some for Christmas this year! That hummus looks amazing…… but not nearly as amazing as the glow bar holiday pack…. which was sold out when I went to buy it today at 1:15 (central). I want one more than anything, there isnt any chance you forgot about one and you wan to sell it to me :-) pleeeaassseee! Ps on a side note made the snicker doodels and brought them to work yeasterday where I am the only vegan and everyone loved them, I made 3 x the recipie and it was gone by noon. They were amazing, and they helped me show my work friends that being vegan doesn’t mean giving up all yummy food for ever! Your recipies are the best!! That’s almost exactly how I make hummus. I very much prefer making my own — and every time I make it, I think “I can’t believe how easy this is!” ;) Happy eating! 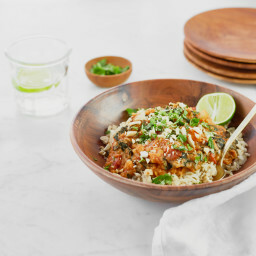 I just made this recipe — it was awesome! I used some leftover bean and garlic mixture from your High Protein Mashed Potatoes I made yesterday (which were also awesome! ), and it worked great. Just a suggestion for anyone else who ended up with too many beans! I tried making your recipe for the humus that changed everything, and it was A-MA-ZING!!! me and my family had it with some toasted baguette slices :) even my dad, who hates humus, loved it!!! i want to save this recipe and have my friends try it too!! :) thank you so much for putting your cooking online for us to see!! yes the tabasco was really fun! My best tip for ultimate, authentic-tasting hummus is to make it in the blender, not the food processor. It takes a little extra work and a bit more chickpea water (usually about 1/4 cup) but it yields the most fantastically smooth and creamy hummus. Even my fiance loves it and he always pretends to hate healthy food, ha ha. I just whipped up a batch of your recipe tonight and it’s fantastic! Like I said, I stuck it all in the blender and also added a bit more chickpea water plus two tablespoons of olive oil. It’s out of this world delicious! Leave it to Ina to design the perfect hummus…yum. I’m going to be catering for a yoga teacher training retreat this summer so I have been stocking up on hummus recipes! 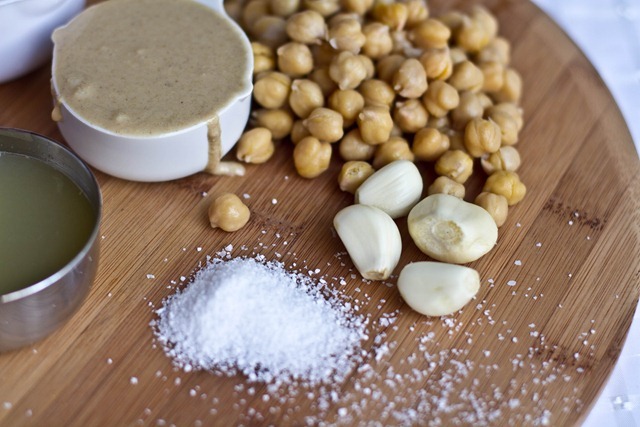 My favorite is to sub about 1/2 of the chickpeas with edamame, use lime instead of lemon, and sub out the tahini for macadamia nuts. You have to add a little more liquid, but it makes a really delicious hummus! Another tip–I have a really crummy food processor–I just end up with chunky hummus :( so I started using my immersion blender. It works so well! OMG Hummus. That’s what this should be called…it’s so good! Do NOT use the liquid from the can – almost all can’s are lined with plastic – so that liquid that you are using is loaded with BPA. Unless you buy your chickpeas from someone like Eden Foods, who uses a ceramic can liner, the liquid should always be drained – no exceptions. Hello! 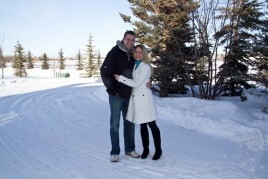 I love your website…Im working on transfering my family to a more natural way of life….LOVE your site. Stumbled upon it through pinterest and I looked at every single recipe you have! Even saved it to my favorites! My question is- I have been looking for a recipe for a granola bar similar to your Holiday Glo bars that you aparently sold at christmas time. I wondered if you have posted a recipe for that somewhere and I just cant find it. I would love to make them. THanks. Hey Melissa! 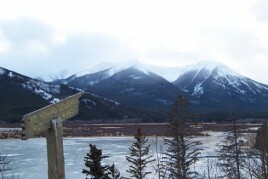 Thanks for your kind words about the blog. I dont have it posted but hope to post a couple glo bar recipes in my cookbook. Take care! Wow. This is literally the best hummus I have ever had! I am currently dipping fresh cucumbers in it. YUM! I would also like to add that I didn’t have any Tahini on hand but I did have some sesame seeds so I put a 1/4 cup of those in there instead as well as an extra clove of garlic (what can I say, I love garlic!). WOW! That is one incredible hummus! Thank you! I left off the olive oil and only used 1/8 tsp of salt. After browsing your website for a few weeks I finally got around to trying one of your recipes…Amazing! This hummus is a game changer. Absolutely perfect! Thank you Angela for your recipes and for the great stories that go into each one. I am going to make this. 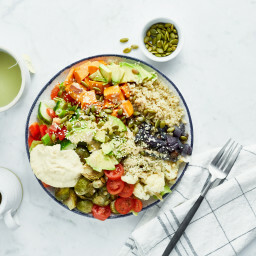 I am so glad you took a photo of the ingredients, especially the tahini sauce. I was wondering what kind to buy. Your blog is really wonderful, thank you so much for sharing it! Lemon juice in lieu of olive oil — never though of it, and I LOVE IT! And the Tabasco was the icing on the cake. I made this for my kids to eat throughout the day with their babysitters, and I ate almost all of it before leaving for work. Definitely my new favorite hummus! Yum!! I have tried several hummus recipes but this one is da bomb!! My sweet daughters are gobbling it up! *” and *, <—- Sorry, I'm a bit of a grammar nut! Wow! I made this tonight having found it on Pinterest and it’s amazing!! We love hummous and this will definitely save us some money. Thank you! Sound syummy. I will try this because I love hummus. I’m really picky when it comes to hummus, so I only ever eat it when I’m at my fav restaurant… Most of the super-market brands are either super heavy on tahini or spices (like cumin.) I like just plain with lemon and garlic (roasted,) and when I have the time I follow a recipe similar to this but simmer the canned chickpeas in water with a clove of garlic, then strain and puree the garlic (cooked and fresh) lemon juice, and tahini together, and then the chickpeas, which I found results in a really creamy texture without skinning them first. I made my own hummus a week ago for the first time, using a similar recipe. And, just like you, I’m pretty sure I won’t go back to store-bought again! Who knew that something so simple could be so superior when created at home? This is, indeed, the hummus that changed everything. I’ve been making my own hummus for a year now using a “pretty good” recipe that I found online….but it just never quite had the taste of the yummy storebought ones. After trying this recipe…. “EUREKA! I’ve found it!” More tahini and more lemon! (and I’m sure the Tabasco helps….I’ve been using the green one which has a little less kick and is perfect for us). Thank you also to the peeps who wrote about removing the skins for a smoother texture! I think it really does make a difference. I’m hooked! I just made this recipe, and I will never be buying hummus from the store again! I was on a chickpea and tahini kick tonight because I made your Buddha Bowl with the Lightened Up Lemon Tahini sauce and had cooked up way too many chickpeas (I still have some in the fridge). I used my blender for this, and the texture came out just perfect. I did add some cumin, and crushed red chili peppers, but I like it hot. =P This will be so good on my salads and wraps! On a side note, it was fantastic straight from the blender as well! Your write-up has proven useful to us. It’s extremely informative and you’re clearly really knowledgeable in this area. You possess popped my sight in order to various opinion of this particular subject matter using interesting and reliable content material. It is 7:50am and my girls (3.5y and 21m) are gathered around a bowl eating carrots and this delicious hummus!!! I’ve been going through so many of your previous posts, having just discovered your website a couple weeks ago. AMAZING!!! – How would you modify this recipe to mimic the Fontaine Sante “vegetable” flavored hummus — it’s got a green label. – How would you go about making one of their famous vege pates??? First recipe that I’ve tried from your blog (but it certainly will NOT be the last…I think I want to try everything you’ve posted! )…This was amazing, even though I forgot the garlic! (I’ll *have* to add it before I sit down to dinner with my veggies, hummus and wine.) 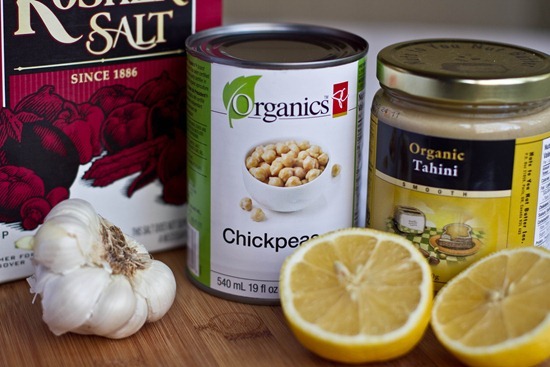 I also made the chickpeas from scratch – what an amazing difference in flavor! Your recipes are the best form of encouragement. Thanks! I loved the addition of the tahini but found this to be way too much lemon. Did you mean 7-8 teaspoons? Thanks. Sorry Allyson, I did mean tablespoons but I probably should have called it LEMONY hummus to emphasize how lemony it is. Thanks for your feedback! I buy dried chick peas and soak in water – does this mean that i would cook them first to make this hummus? Yes cook them before making the hummus – enjoy! By far my favorite Hummus recipe. 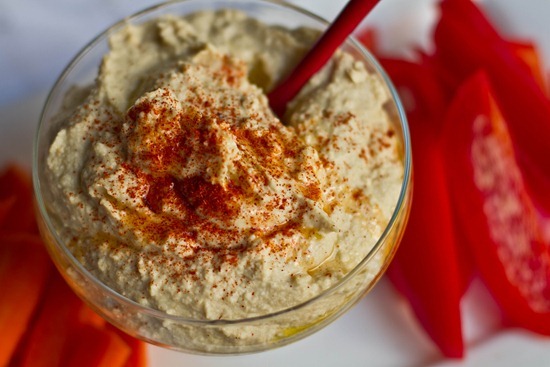 Eager to try your red pepper and edamame hummus recipes next! Also have to share this great find on my Pinterest to Vegan Food board. Tip: Not all Tahini is made equal. Different brands changed the flavor of my hummus. If someone out there finds they don’t like hummus it’s probably the tahini that was added. I make homemade hummus and every time it goes bad by the third day. It starts getting a little fizzy and there are air pockets in it and I have no idea what I am doing wrong. I soak the beans overnight, boil them, then blend the usual suspects for a delicious hummus. I put it in a tupperware container and refrigerate. I get two days of normal hummus then, hmm, this doesnt seem quite right Honey. The recipe name says it all for me, too! I’ve tried so many hummus recipes but never found one that just ‘hit the spot’ until I made this one. Now, it’s my favorite hummus! Ceamy lusciousness on bread with slices of tomato and avocado… Mmm, good!!! Thanks so much, Angela, for passing on the perfect hummus recipe!!! Thanks for the recipe … I tried it and LOVED it. I also skinned each chickpea before tossing in the food processor to achieve a super smooth hummus texture. It was a little time consuming, but it only took 15 minutes and made a noticeable difference. If squeezed just right, the chickpea slides right out of the skin. This was yum!! I had previously given up on making my own hummus, but after finishing off my hummus for the week in 4 days (at a price of $5.99), I decided I had to give it another try. I must say, this was without a doubt the best hummus I’ve ever tasted. This is coming from someone who has been to the Middle East several times and frequents Middle Eastern restaurants regularly. Hummus is of course in the eye of beholder, and there are so many different recipes with different consistencies and flavors, but I just love this one. It is on the thicker side, and the store-brand hummus it reminds me of the most, both in flavor and texture/consistency, is Athenos original hummus. Anyways, I highly recommend this recipe, and I enjoy your blog a lot, keep up the great work! I made this tonight and it is DELICIOUS. This is my new go-to hummus recipe! I have made it a few times with different variations. Today I did half white (cannellini) beans and half chickpeas. Last time I removed most of the chickpea skins, but this time I did not. Both times it yielded a very smooth hummus so I am not sure if skinning the chickpeas is completely worth the time. I love dipping raw veggies or crackers in this hummus – SO GOOD :) I have also been having mixed greens salads with lots of fresh veggies, quinoa, olive oil, red wine vinegar, and a dollop of this hummus on the side. Thank you for another great recipe! I love this hummus. I had hoped to use it for lunches this week but the first batch has gone already! Need to make another one. I love this hummus! What really makes it taste special to me is that you left out the cumin and so the clean fresh taste of the hummus can shine :) I also made a batch of your spiced pita chips (from the OSG cookbook)… AMAZING! I think that I heard angels sing when I took my first bite!!! I’ve made hummus for years but as easy as it is to make, I’ve never been happy with my “recipe”, no matter how much I doctored it up. Who knew that the trick for me, anyway, was to leave out the cumin and add some hot sauce? I tried this tonight and I didn’t have any hot sauce in the house but I used siracha and it came out great! Thank you so much! This was amazing hummus – have made it twice now. I didn’t even add the salt this time and it was still amazing. Will be making over and over. Thank you!! OK, I just *finally* got around to trying this recipe and WOW! I think it is better than Fontaine Sante!! Thank you so much!! Hi Suzan, 1 cup has 16 tablespoons in it so 7-8 is much less. 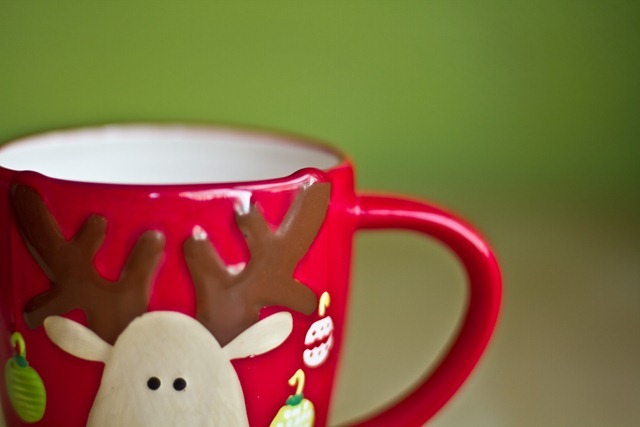 :) Hope you didn’t use a full cup – yes that would be tart! Oh my god I love hummus so much,and this would save me so much of money! So simple and easy! Thank you for sharing! I love hummus so much! I used this recipe and omitted oil. So good! I MADE THIS!!!!! and i loved it so so much!!!! thank you!! ! It was so pretty w the paprika on top too. So glad you enjoyed it, Risa! OMG! I was searching for “better than LaFontaine hummus” and guess what I found! Made it exactly and it was FAB!! Love all the comments for future variations! Thanks!! Super DELICIOUS! Glad you’re enjoying it, Leanne! Have fun experimenting with those variations, too. This hummus recipe is fantastic! Thanks! 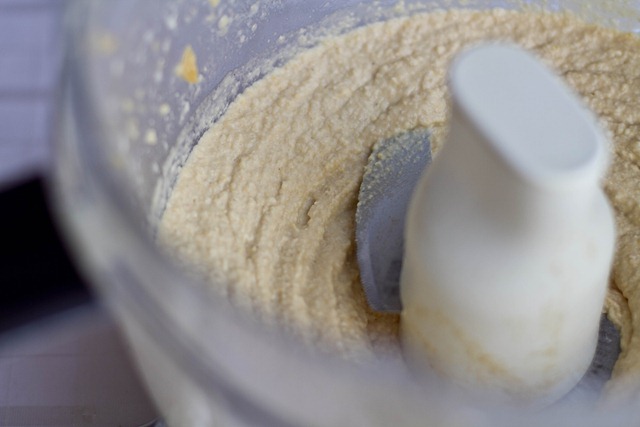 One idea that I came across recently for making the hummus a little creamer and blending the flavors even better is to add just the tahini and lemon juice to the food processor and process till smooth and creamy. I stop the processor and scrape the sides and then blend again to make sure it is really smooth. Then add the rest of the ingredients. That is how I made this version and it turned out great! Do you find it best to remove the “skin” from each chickpea? I’ve done this before, and it definitely results in a smoother hummus. However, it’s quite time-consuming so I don’t do it very often. :) Apparently if you have a Vitamix it makes really smooth hummus (I have yet to try it though!). Thanks for sharing this. Have been trying hummus recipes for months looking for something that is as good as you get at a middle eastern restaurant. Nothing has come close until now. Not only is this as good as any I’ve had I would say even better. I tried this today,and it was fabulous,my husband just loved it, definitely wort saving.Thanks for sharing, Blessings. Wow! I have been making your recipes for years but for some reason have never made your hummus. It’s a revelation. Throw all your other hummus recipes away people!